Sedona is an iconic area where you can truly immerse yourself in the beauty of the west, sadly many people simply pass through, taking a few photos and checking it off the list. Those who know Sedona know there is a rich heritage, incredible natural beauty, with so much to discover and experience. 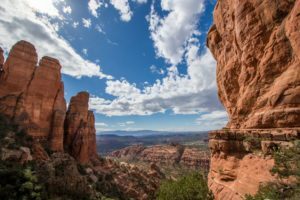 From hiking trails and biking paths, energy vortexes and western history to fine dining, art, music, and wine, Sedona has so much to offer visitors. The key to an unforgettable visit is having a knowledgeable and enthusiastic host. Not everyone has a close friend or family member in Arizona, so the preferred option would be a stay at a boutique hotel with personal service the priority. 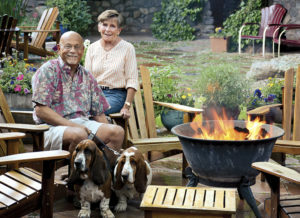 Steve and Connie Segner, owners of El Portal Sedona Hotel, stress the importance of a customized Sedona experience. The Segners and staff run El Portal a hacienda-inspired, 12 room luxury inn adjacent to historic Tlaquepaque Arts & Crafts Village. Their mission is to give guests an outstanding experience in Sedona and beyond. A long-time resident of the historic Arizona community and an avid outdoorsman, Steve helps guests plan their day, whether it’s choosing hiking trails, art galleries, kayaking, hot air balloon rides, wineries or a customized Sedona jeep tour. “Our mission is to meet each guest and help them plan their stay,” Steve says. “We want everyone to get the most from their visit whether they are here for outdoor adventure, have certain sights they want to see or just want to relax. We offer our guests personalized concierge services for the Sedona area. We don’t just hand them a room key, we want to make a personal connection with our guests, and have them make a personal connection to the area.” Guests who want to take excursions to the Grand Canyon or other nearby attractions can let Steve or Terri make all of the arrangements for customized tours and adventures. After a day of exploring, El Portal provides luxurious yet unpretentious accommodations for guests, with 12 thoughtfully appointed and spacious rooms. Rooms vary in style and décor and may include such features as a corner fireplace with river rock stone, whirlpool baths, French doors, high-beamed ceilings, a private garden or sitting terrace. 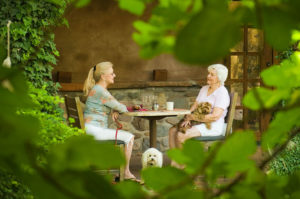 The Segners built El Portal Sedona with the goal of creating a historically accurate luxury hacienda that is designed to make guests feel at home. The property was also designed with pets in mind, and pets are always welcomed as a part of travelers’ families. It is a pet friendly hotel that welcomes pets with a treat basket and there are no fees for pets. Steve says, “We actually want all our guests to have a ‘non-hotel’ kind of experience, where they can meet other guests and locals for a true Sedona experience.” The Sedona hotel has several areas such as the great room and the courtyard where guests can relax with a glass of wine at the end of the day, unwind and chat with their hosts or other guests. There is also a full gourmet breakfast each morning, where guests can prepare for the day’s activities. Steve is passionate about his job and the fact that he interacts with all of his guests. “I meet about three thousand interesting people every year. It’s a great job!” He knows that it is the personal touch and that he has an impact on those who choose to experience Sedona the El Portal way. For those travelers, Sedona will be a treasured memory.